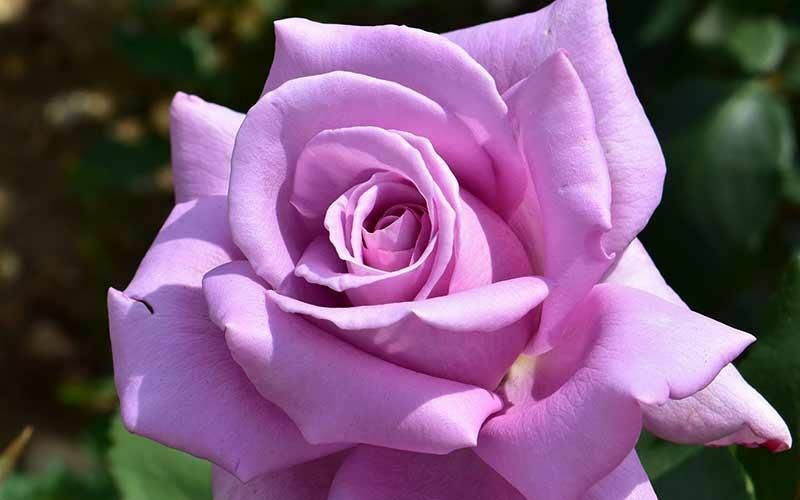 Hybrid Tea roses are easily recognised by their large flowers and pointed buds and are often what people first visualise when thinking about roses. Unlike Floribunda roses which produce clusters of flowers, Hybrid Tea roses tend to produce just a single flower on the end of each stem. Like many modern garden roses Hybrid Teas also have a long flowering period, from early summer until the first frosts of autumn and will benefit from annual pruning and regular feeding with a good rose fertilizer in early spring, early summer and fortnightly liquid feeds throughout the flowering period. Large blooms of swirling white, red, yellow flames, coupled with a good perfume. An absolutely delightful bi-coloured rose. Bred by Delbard. (H.T.) A charming, single variety. Pronounced golden anthers framed by wavy petals of cream and pink. Upright growth. Foliage and stems tinted purple. This vigorous and erected rose bush produces large, double, beautiful pink blooms in abundance. Complemented with an intense fragrance and bright dark green foliage. Disease resistant. Bred by Delbard. (H.T) A blend of crimson, scarlet and brighter shades. Fragrant, very large and double. A weak neck in some weather conditions should not put you off this lovely old variety. Deep red blooms with black velvet reflections, the reverse of the petals reveal a glitter sheen. Flowering throughout summer, ideal for cutting. Bred by Delbard. (Hybrid Tea) 'Flaming Peace' Sport from 'Peace' with most of that variety's characteristics. Colour crimson flushed silver and yellow. Good, glossy foliage. (H.T.) Of great historical importance as the first H.T. A bloom of great beauty and fragrance. High centred, clear rose pink with a slight reflex in the petals as it opens. Deservedly well known and loved.